According to the statistics gathered by Google, Facebook, and Yahoo, over 75% of our network traffic to their sites is being done over IPv6. This past June, Gustavus Adolphus College joined the World IPv6 Launch network operators list and publicly committed to supporting IPv6 on our campus network to the best of our ability. So far it looks like our work is paying off. Gustavus was singled out in a recent blog post by the World IPv6 Launch site as having over 75% of our network traffic to monitored sites done over IPv6. 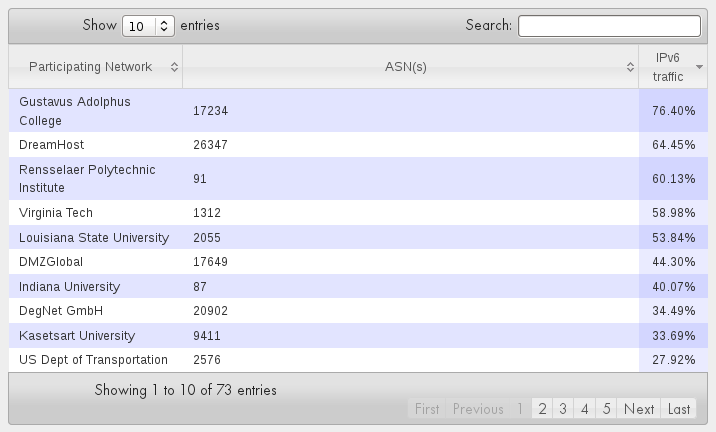 Looking at the image to the right you can see that Gustavus tops the list of all the monitored networks with the highest percentage of IPv6 traffic. 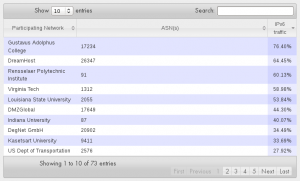 Ahead of other well known institutions such as Virginia Tech, and University of Wisconsin – Madison, both of whom have respectable amounts of IPv6 traffic. It has not been all smooth sailing for IPv6 at Gustavus since we first started investigating IPv6 back in 2007. Most recently we have had issues with our wireless network causing IPv6 traffic to get lost, however our persistence with it seems to be getting us noticed in the IPv6 world and hopefully paving the way for others to follow.